Not nearly as dramatic as the stories of their American counterparts, today's Pedigree Series is on Opodo, the leading European OTA. Opodo was formed in 2000, following the creation of Orbitz. The company had a similar model and a similar structure. The founding airlines included Aer Lingus, Air France, Alitalia, Austrian Airlines, British Airways, Finnair, Iberia, KLM and Lufthansa. The CEO was Giovanni Bisignani, the current outgoing CEO of IATA and former CEO of Alitalia. The site was powered by Amadeus, for what I hope are obvious reasons. 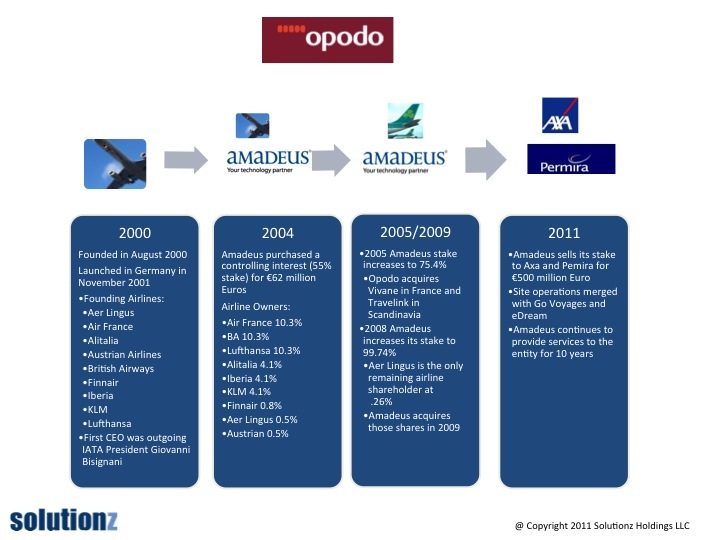 In 2004, Amadeus purchased a controlling interest (55%) of Opodo for 62 million Euro. This followed a large loan to the company in the previous year. This of course diluted the airlines' ownership, but at that time, all the airlines elected to remain owners. In 2005, Amadeus increased their stake to 75.4% and the company made a number of acquisitions. In 2008, they increased their stake to 99.74 percent. Aer Lingus elected to remain a shareholder at .26 percent. One would say "why bother?". Amadeus acquired those shares in 2009. In 2011, Amadeus sold its stake to private equity players, Axa and Pemira, for 500 million Euros. The new owners are merging in Opodo with Go Voyages and eDream. Amadeus netted a 10 year services deal out of the transaction. Smart. And that is the "rest of the story". Tomorrow, in the last and final story in the OTA Pedigree Series, we'll touch on both Priceline and Zuji, both of whom have a very simple story, as there has not been a lot of ownership change.